It's shocking, I know, but I didn't read Judy Blume when I was a kid. I always preferred speculative and historical fiction to realist novels, and English authors to American ones, so it's not surprising that Judy Blume slipped through my personal reading net. 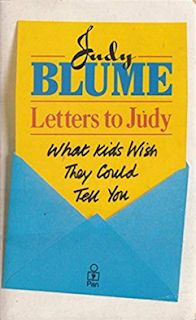 However, my friend Heather is a huge fan, and after reading Letters To Judy, I have a new respect for Blume's work and the effect she clearly had (and no doubt still has) on her readers. This is a moving and emotional volume, directed ostensibly at parents. The letters are grouped into subjects, from sibling rivalry and divorce, to facing death and dealing with sexual abuse. Seeing what some of these kids have had to navigate is quite confronting; in some cases, Blume kept up correspondence with the most troubled letter-writers for years, doing what she could to advise and assist. Blume is honest in acknowledging her own parenting mistakes, and reveals very personal details of her life, admitting she re-married too soon, and how she struggled with her role as step-mother. Clearly, these experiences have informed her writing and her honesty is part of what attracts her readers. Though it was published in 1986, this book is still filled with relevant advice about listening and supporting children and young adults, about sharing your problems and finding help.